Each of want to hear the best of things, even when there are not any “best” things to be told or heard. This passage is like having one of those times happen upon us, where we’d rather hear the “good” and leave the bad behind – but we must have the good and the bad alike in life. To go right along with that, assurance that through the tumultuous time that someone is going to be right there with us – experiencing it too – can be all the comfort we need to face that circumstance with some amount of dignity. Just as a friend and missionary in Honduras wrote recently, we must remember we are NOT doing this alone, the very Creator of Everything, God Almighty Himself says to us “I will be with thee“. (her reference is Exodus 3:12 | KJV) As this passage of Scripture was being poured over, something very pointed became VERY clear – He is our EVERY THING as Christians. Not only is He our Creator, but also our Redeemer, our LORD, our God, our Holy One, our King, our Way… Anyone who thinks He just created us and left us to fend for ourselves, doesn’t know the Heart of God one bit! That phrase is one that has been in my personal hearing for nearly all my life – it was a replacement for “finders keepers, losers weepers” many have heard as a child, it would be guessed. This passage actually puts that possession replacement thought into action, He found us and weeps when we lose our way, but wants desperately for us to return to Him. He provided Redemption for us (redeemed), is with us (Holy Spirit), has given all for our return, is Holy and will Forgive us is we will JUST ask Him. It is after-all, what one will do for someone they have given all to provide for, protect and have close to them. We need to realize and understand that He knows our name and everything about us – and as Children of the King, we are indeed His – all 100% of us is His. We make the choice as to how much we are willing to give, which will only be the best of relationships if we give everything we have over to the Lord. 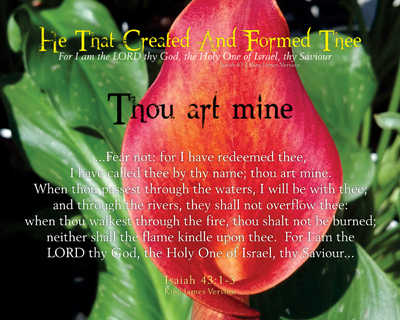 If there is any doubt of His GREAT Love and Concern for us after reading Isaiah 43, we need to take the dedicated time to review the VERY first print and find out what He means by Thou Art Mine – He IS the POSSESSOR. This Series stops at verse 26 of Isaiah 43 for that is where we MUST get to, in order to understand WHY we need to be 100% His. This Series is composed from a single chapter of the Old Testament book of Isaiah, chapter 43. In it is contained Promises from the REAL Promise Keeper, the Creator God, our Heavenly Father, giving His Son – our Saviour, Jesus Christ – as well as a warning of what has happened before us and the falter of others along the way. It is simply amazing how a trigger can be set off in our minds when reading this or that which appears to have a “biblical sense” to it. One might think that is just a coincidence, but really it isn’t that at all. The more of God’s Word we put into our very lives, it will become clear that it is much more than recall which brings it to our mind, our very behavior and thought process is changed and molded by it. The dynamic of the mind is more apt to be desired when an identity is made with one/a person/relationship whom can be trusted. For a Christian, the Holy Spirit has little choice but to show through, if we are truly living for the One and True Living God. May each of us not only desire, but make good on hiding the Word of God in our hearts, such that it would permeate to every facet of our lives just as our Lord did while He was here. As we come upon this or that, may we know where it is from and Who wrote it as our spirit testifies of it being so. Little did I know that a Hymn, that definitely stirs my very soul, would turn into a treasure trove of Bible study and discovering an origin of a Hymn that has weathered quite a storm to be one of the world’s top five (5) Hymn ever written. The hymn (which began as a poem) is a call for the Christian to consider Who God is and who they are to our Creator God, Our Heavenly Father. 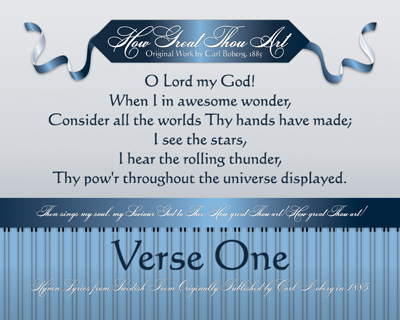 Singing this song with instrumentation (music) is one thing, but to start it off with any form of accompaniment, then dropping off to sing it a Capella, absolutely makes the rafters lift when God’s Children begin to realize just how Great He really is. This Hymn is in the same category for me as “Because He Lives…”, as it focuses on what has been done for us, but we MUST be the participant to realize the full benefit of the words that the hymn talk about. That hymn builds from a deep place within me to a triumphant call to the Master – How GREAT Thou ART!!! There are seven (7) sets of single or double word draws which allowed for a deep scan of the Bible for verses which have made this Series. It is absolutely incredible to me how God has used those in our past to make such an impact on our present, which potentially influences lives for Eternity. It became very clear after looking at the first verse of the Hymn “How Great Thou Art” that definitions were not going to stand in the gap with this Series, it would have to be Scripture. Across seven (7) catch words/phrases, twenty-eight (28) times is found manners in which we can say “How Great” our God REALLY is to us. If there has ever been a passage of Scripture that captures the very essence of the turmoil that can occur in a Christian’s life, this one is it! The entire chapter of Psalm 31 | KJV embodies a life choice, one made that says to not only the person speaking it, but to all that witness it, to depend on the provision of Almighty God. No matter what has come, is coming or will come in their lives, it is a passage all about Hope. Leslie Deatherage has shown us through her life and the lives of her children, Salvation lived out in a nut shell. She shared her testimony with a ladies group at a local church in the Raleigh area recently, which has most definitely blessed the lives of EVERY person who has had the opportunity to listen in and gain more understanding of her incredible story. This Series is dedicated to Ms. Leslie, truly a godly woman who has demonstrated the placement of her Faith and Trust in her Saviour, Lord and Creator. In the mind of everyone who lives and breathes, there is the universal concept of Trust – we can place trust in so many things and demonstrate that trust in various ways. The most important area of Trust for us is of course Eternal, placing Faith in the Son of the Living God for Salvation. Living it out is a WHOLE ‘nother matter though. We can clearly see the Trust that a child has for a parent when that parent asks the child to do something they have never done before, which steps them out of their realm of understanding or even comprehension. “I’ll catch you” is one of those phrases most people can identify with, as might be “Just trust me…” issued by someone they’ve placed great FAITH. Trust and Faith go hand in hand. If we have Faith, then we should Trust – it is a choice each of us make each and every day of our lives. This ONE Psalm is an Incredible reminder to each of us as Christians, not only that we can Trust Him, but that we WILL determine the keep Choosing Him. The following twelve (12) words describe what God the Creator will do for us as we learn to Trust Him more. It doesn’t take a tragedy or great loss for us to make the decision to Trust Him, but it does become very evident whether or not we have made the decision when trials and tribulations occur in our lives. When we know of nothing else to do, we could make that choice in desperation – but those that have done so in preparation, have a humble spirit and can take those steps of uncertainty because they understand Who holds their hand. Oh, that we would each learn to TRUST Him more! Ms. Leslie – THANK YOU for demonstrating that for each of us, not only in the Testimony that you speak, but also in the One that you live. This Series has spoken to me personally in that there is an identification made in such a VERY clear manner – my own experience with suffering from Cluster Headaches (CH) and the side effects they bring. Many people have no idea what a CH is, much less that they come in two flavors: episodic and chronic. Episodic means that they come in limited time periods or episodes, then disappear for weeks, months or even years before another one is experienced. Chronic is a simple way of saying they they occur in a constant fashion, in a defined rhythm – ALL the time, every day. They’ve been termed “alarm clock” headaches, as they most of the time strike at the same time interval each day, within a minute or two of the last one 24 hours earlier. Mine are VERY precise. With that posed question that surely is running through your mind about now, HOW does Suffering, Endurance, Character and Hope give God Glory in the case you described as your ordeal? Simple one! Through my Suffering, I’ve drawn closer to my Saviour, Jesus Christ, and have learned the Throne Room of Heaven is available, with Almighty God, no matter the minute, hour or day. By doing so, my Endurance has been well more than my words could convey – the ability and energy to do so always comes when I least expect it. While NOT perfect by any means, it is hoped that my Character does show through for the time that I spend with God the Father – it is diligently sought after and found. Each of those things together give me Hope in my Saviour and that He will equip me to do all of those things He desires for me. Each and every thing we do should be done so to Glorify the Lord! So, does reading your Bible, Praying, Meditating on His Word, going to church, witnessing by telling others about Jesus and a host of other things going to keep a person from suffering? No where in the Bible will anyone find that result, but we will find that the Holy Spirit will always be there with us and that our Lord and Saviour Jesus Christ intercedes for us on our behalf. The tribulation that we experience, we indeed can “glory in” because there is purpose in what we do – an Eternal Purpose – guided, provided and presided by the very Creator of all that is, was and ever will be. It will seem so simple, maybe even too simple, to understand that the steps that the very Creator of the Universe asks of us is SO down to earth, doable and possible. The Concept to Proof is the Series itself with a few declarations will be a place where each of us can see that we indeed can go From Suffering to Hope, giving God the Glory. Each of us have different struggles, challenges and periods of tribulation – if not, we’d all be alike and have nothing to distinguish ourselves! With that said though, we can allow those things to define us, cheating us out of the opportunity to allow God to mold, set and define who we are in spite of our difficulties. Never once has He failed me, nor left me without a sense of His Presence – that is VERY important to understand. Trials will come, tribulations will linger, but nothing can prevail against Him. Who are you depending on in your darkest hour? How will we respond to His Still, Small, Quiet Voice as the next storm appears? May it be found of and in me that I would be “giving God the Glory” for all He’s done for me! This world has become a more unforgiving place, where the Saved and unsaved alike are subjected to serving self and creating their own “little” world which pleases self. Fewer and fewer people want to take the time to see the “best” in others, possibly not realizing that they are being blinded by the example placed in front of them (you and me included) in all realms of social sharing who seek to build themselves up. As that building up of oneself occurs, an alarming tendency starts to emerge, one that can creep in unaware – the erosion of concern and having/showing mercy for others. Mercy begins in the heart, allowing the individual to forgive. (period) NOTICE there is no blank, following “things” that can be or might be considered for “forgiving” at a specified time, whether that be in the past, present or future. Also notice with me that it is specific, about known things, events, occurrences – an understanding is established of not only the injury and hurt, but also the punishment is also known – thus so are the potential consequence of the actions to be taken. The more we consider the action of Mercy, the more we will understand what the LORD provided by His Mercy to each of us. Live Mercy, Live Compassion, Live Forgiveness and Live the Promise of Almighty God! We each are given that opportunity, but we must determine to do so and be determined in our doing so. We have to be willing to look – we have the Book. Second, a desire to seek out what the Word of God says about Mercy is required – what good is the Good Book if no one is willing to take the time see what is provided within the pages. Third, each person who takes the time to do so, must make application of what they find in their own life. Once that three step process is put into motion: look, seek and find – we each will begin to discover what His Mercy really is. It is my hope that each person that does so will experience His Mercy in an entirely different aspect and light! The thirty (30) items may at first look daunting and lengthy, but they simply are stated as “His Mercy” is…, or just the statement unless it has the verb included. When they are made personal, they become POWERFUL – for the Holy Spirit is PERSONAL and POWERFUL, beginning at “His Mercy is Great Mercy” through to “His Mercy is Looking Eternal“. It is important for every Christian to determine to look, seek and find His Mercy in the Word of the Most High and Holy God. Each of us determine what we are going to do with each of our given days, for which we individually have to account for them. Inside of you and me is a level of Mercy which none of us can afford, nor could we ever purchase on our own – that Mercy is the indwelling of the Holy Spirit. God the Father’s Mercy was given to all man-kind through the Sacrifice of His Son, Jesus Christ – the birth, life, death, burial and RESURRECTION – entirely. That alone should cause us to desire to know more about His Mercy towards us and what we should show, having compassion, as we live our daily lives amongst this world. As we learn more about His Mercy, the easier it will become to share those discoveries with others. Our direction will change. The things we see in others will change. 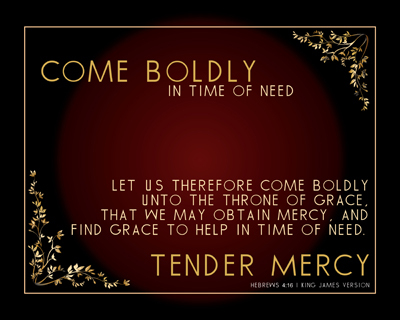 You see, each of these Mercy items, thirty (30) of them, will change us utterly – where others will plainly see His Mercy at work in our lives – if only we would DETERMINE to look, seek and find Him. Indeed, each of them has been paid for, redeemed, by the ONLY ONE that could… Jesus Christ. This little “micro” Series is actually a part of a MUCH larger set of designs, but it is important to me to keep them separated. They have actually been building for several months, for which these five (5) passages of Scripture were discovered along the pathway of a “repair” job so to speak. Each time that set incidents came to my mind, a new verse would just be sitting right in front of me to grab hold of – beginning with the very first one, it was known exactly what it was presented to address. As they were discovered to apply, they were proof that an answer to a question was being provided. A simple e-mail was constructed upon completion of the collecting with the simple subject of: “To Answer A Question For You…” Those verses and time spent in the Word of God, not only displayed mercy, but modeled it before my very heart. The other four (4) verses referenced are the additional ones that make up this Series. The five (5) passages of Scripture allowed for the creation of five thoughts and phrases for this Series which all build upon themselves to the end. Is there something that has been done, things said, hurts inflicted or words spread that hinder us from having the kind of Joy that God the Creator intended for us to have? As we seek Mercy, may we find Grace in our time of need, granted from the only place it cannot be corrupted – from Heaven above and the one who paid for it with His life – Our Lord and Saviour. May we seek to have and show the Love of God in us, even more so in the difficult times and utterly to those around us.